Reggie Watts is brilliant. Hilarious and brilliant. I'm not sure if he is more hilarious than brilliant. I think it's 2 parts hilarious one part brilliant. Wait...I think I got that reversed. 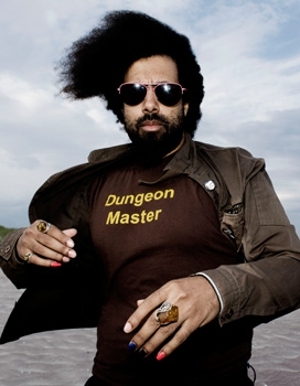 Reggie Watts is one part comedian and one part musician with two parts awesome. Reggie released his debut comedy cd/dvd 'Why $#!+ So Crazy?' on Comedy Central Records in May 2010. His latest album entitled 'Reggie Watts Live at Third Man Records' is available on limited edition vinyl. He was also the lead singer in the band Maktub, an arabic word meaning "it is written". That's an awesome group, but hasn't released anything of note since 2009. Reggie's improvised musical sets are created on-the-spot using his voice and a looping machine. He doesn't ever do the same song again, and although he disappoints fans of his albums at live shows since he can't play the "called-out" requests. You can count on an experience that's 100% unique to you and those in the room. He layers beats and melodies, runs that and his voice through some effects pedals, and there you have it. It's simple and effective. Once he has his beat he just sing/raps improvisational lyric over that. I just think his creations are so unique and amazing, and I'm sure you would love checking out his music and his comedy DVD. Go check those out and let me know what you think in the comments.